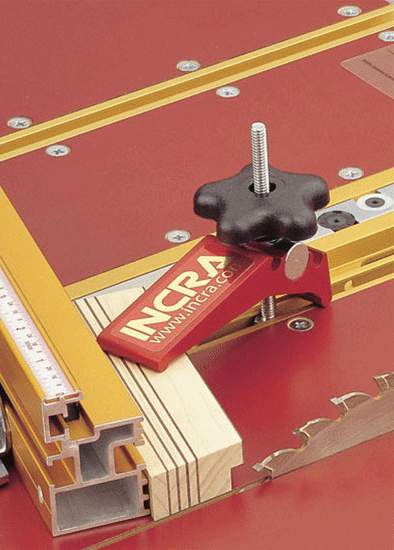 INCRA's Miter Express offers any miter gauge owner the safest and most accurate cross-cutting platform available. 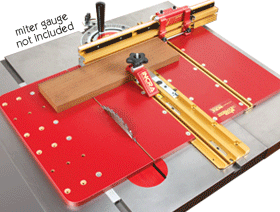 Miter gauge & fence sold separately; use the Miter Express with ANY standard miter gauge! Available for traditional 3/4” x 3/8” miter slots and Shopsmith machines. Shown above with an optional INCRA Miter 1000SE mounted and ready, the Express features 2 embedded T-Slot channels to secure the included Hold Down Clamp and Outboard Fence Support. These slots are also invaluable for mounting your own custom Jigs and Fixtures. 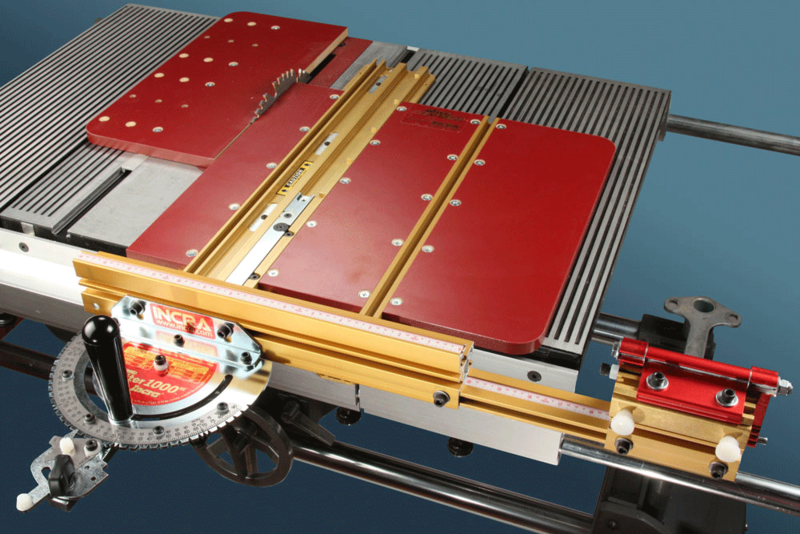 The advantages are simple: The Miter Express doubles your miter gauge's capacity for cutting large panels, it offers more hold down options for greater safety when cutting small parts, and it provides better control overall because the lumber is carried through the blade instead of pushed across the saw. 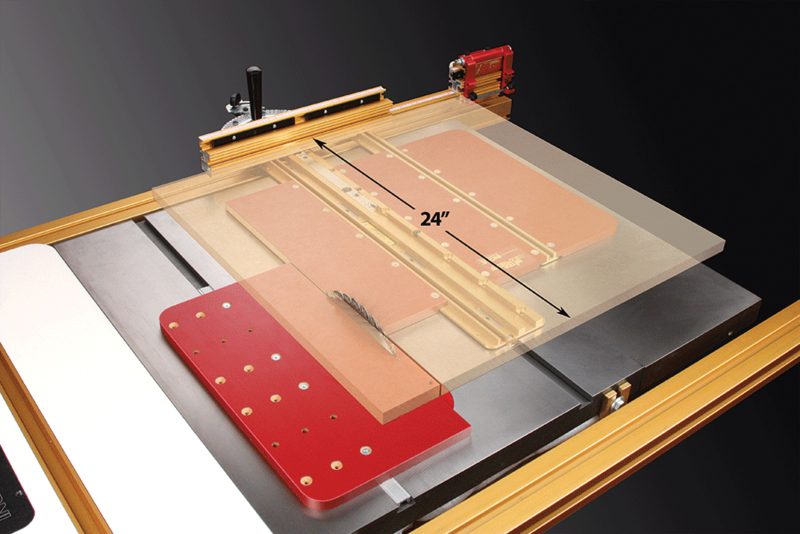 The crosscut capacity of any miter gauge is safely doubled to more than 24" when docked on top of the Miter Express. For these extra-large crosscuts, the non-drag support provided by the sliding panel, along with the extra holding power of the included Hold Down Clamp adds much needed stability and control. As shown on the right, the same INCRA Hold Down Clamp also keeps your fingers comfortably away from the blade when cutting workpieces that are too small to safely hold by hand. The Miter Express also includes an Outboard Fence Support that locks behind your fence in one of the two T-Slots, providing even more rigidity for all operations. 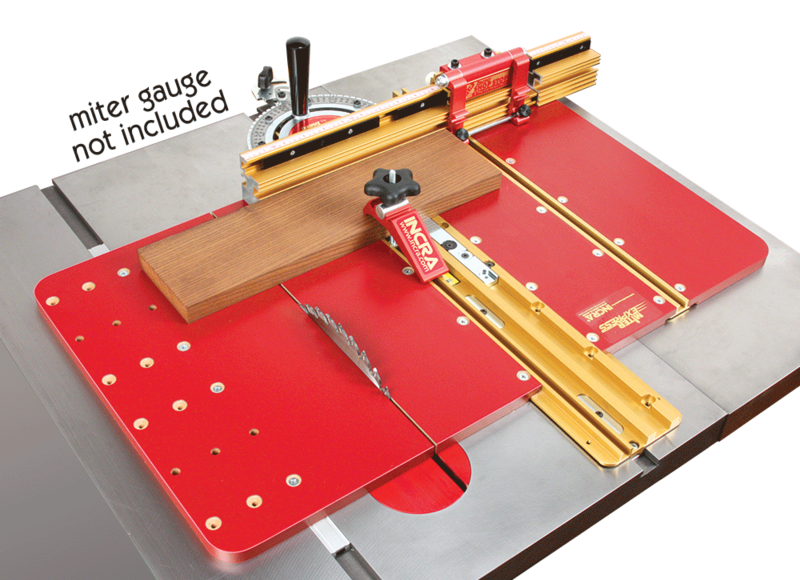 Shopsmith’s unique miter slot size has previously made it difficult to upgrade the miter gauge, but the Shopsmith version of the Miter Express allows you to mount ANY brand of miter gauge to the sled platform (optional Miter 1000SE shown), and it works with the Shopsmith gauge, too! The sliding main panel and the locking drop-off support panel are each trimmed with one simple cut during assembly for a perfect fit on YOUR table saw. The result is true Zero-Clearance Tearout Control on BOTH sides of the blade. 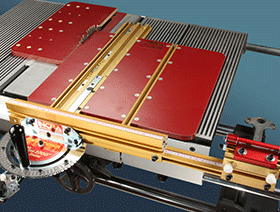 The Miter Express is instantly removable from your saw table when making rip cuts or other operations that don't require a sled. And thanks to INCRA's quick release feature, your miter gauge undocks from the Express in seconds whenever you want to use your gauge on another tool such as a router table or sanding station. The Miter Express features a miter bar that's conveniently adjustable from above for a perfect fit in the miter slots of either traditional 3/4" x 3/8" or Shopsmith sizes. - Doubles Any Miter Gauge's Crosscut Range Up to 24"
- Miter slot spacing: The max distance between the miter slots is 14" center-to-center. - Table size: For adequate support, the Miter Express requires a minimum of 11" from the side of the blade to either the left or right edges of the saw (sled can be installed on either side of the blade). 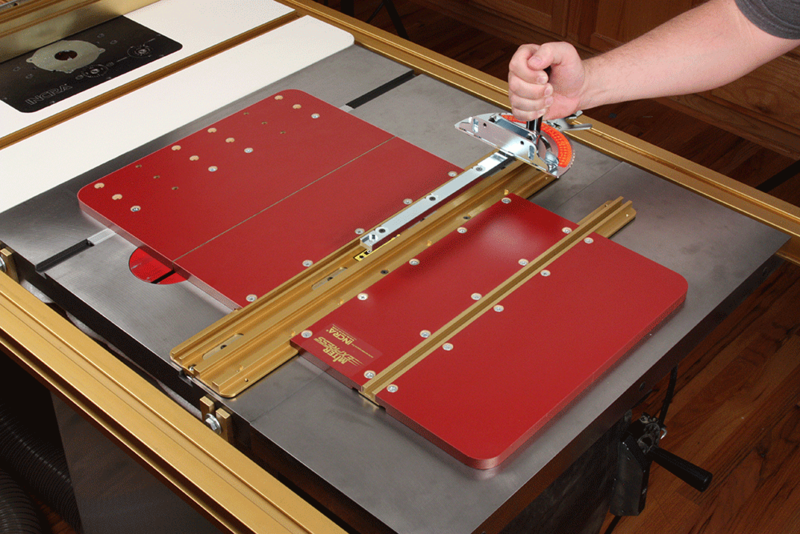 Lock-in or Remove Any Miter Gauge in Seconds. The massive central Utility Plate incorporates a quick-release mechanism that allows you to instantly lock in place or remove any miter gauge that uses a standard- or Shopsmith-sized miter bar. 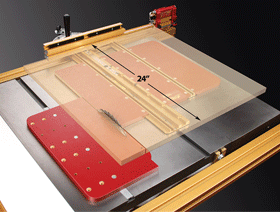 The quick-release feature leaves your miter gauge free for use at other machines in your shop. 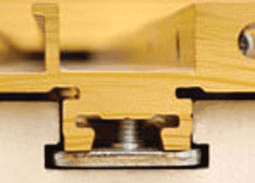 T-Slot Retaining Clips for sled stability at both the beginning and end of long crosscuts. The INCRA Hold Down Clamp The Miter Express also includes the new INCRA Hold Down Clamp. This makes miter cuts on small pieces more accurate and secure than ever before while keeping your fingers safely away from the cutter. Click to download INCRA Miter Express Manual in PDF format. Click to download INCRA Miter Express Video in Windows Media format. panel" that's cut during the initial setup of the Miter Express. INCRA Miter 1000SE The main product photo shown above with an optional INCRA Miter 1000SE mounted and ready.